Exclusive offer for Verizon customers. Transform your SB into more Verizon mobile data! 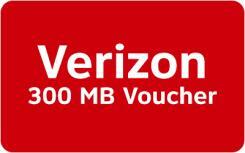 Click this link to verify your eligibility for the Verizon Mobile Data Rewards: Verizon Eligibility Verification Check. Connect it to the nation's largest, most reliable 4G LTE Network. This promotion is available to Verizon Wireless postpaid consumer subscribers within the contiguous United States with the MORE Everything®Plan or The Verizon Plan and only applies to domestic data usage.